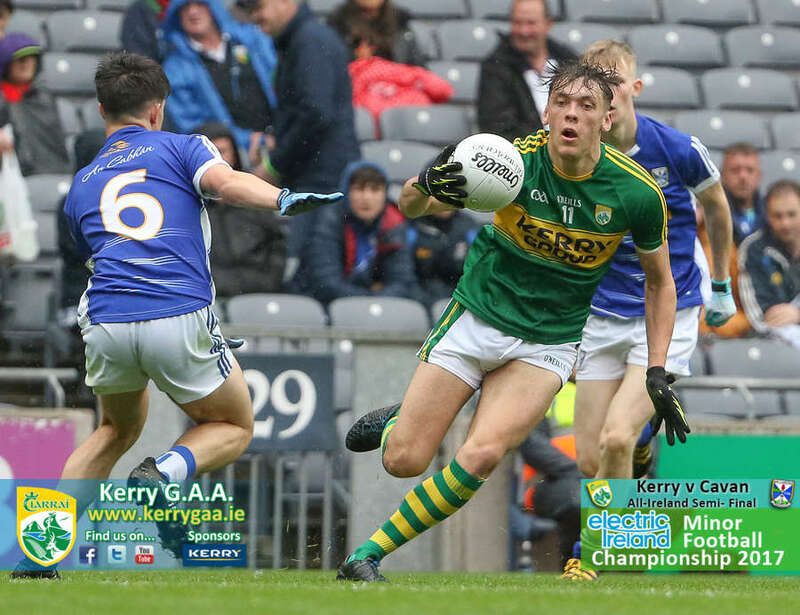 Following last Sunday’s semi-final, Kerry minors now know that Derry will be their opponents in this year’s Electric Ireland All Ireland minor final on September 17th. In the end Derry were full value for their four point victory over Dublin and no doubt they will prove a major obstacle in the final for the Kingdom who do have the advantage of an additional week to prepare for the final. A dynamic Derry outfit kicked seven of the last nine points to secure a splendid victory over Dublin at Croke Park. Damian McErlain’s talented team finished with a real flourish to advance to next month’s decider against Kerry. Dublin contributed handsomely to an open and attractive encounter that was decided by a brilliant Derry burst in the closing stages. Lorcan McWilliams was accurate from pressure frees as Dublin, who looked to the excellent James Doran for inspiration, were beaten. Ultimately, the opening period was all about Dublin’s efficiency converting chances as Tom Gray’s clinical outfit registered 0-8 from 12 shots before the break. Derry had probed throughout an entertaining first half, but they only struck 0-7 from 17 attempts which was a worry at the turnaround. An early flurry from the Ulster standard bearers, with Patrick Quigg and Lorcan McWilliams prominent, ensured they edged 0-5 to 0-2 ahead by the 11th minute. Gradually, though, Dublin improved with Ross McGarry sharp inside and they were level at 0-6 each by the 25th minute. Further scores from McGarry and David Lacey were sandwiched either side of a Quigg free as Dublin led 0-8 to 0-7 at the interval. With Doran a constant threat Dublin were two points ahead by the 43rd minute, but then Derry seized the initiative. Lorcan McWilliams (2), Richie Mullan, and Ben McCarron all found the range before Doran narrowed the gap to the minimum. Once more Derry responded as McCarron, Lorcan McWilliams, and Jon Paul Devlin nailed points. Doran’s sixth point of the hour brought Dublin to within a goal, but Derry stayed cool and composed in the dying moments. Scorers for Derry: Lorcan McWilliams 0-6 (5fs), Patrick Quigg 0-4 (3fs), Ben McCarron 0-3 (2fs), Richie Mullan, Mark McGrogan, Jon Paul Devlin, Oisin McWilliams 0-1 each. Scorers for Dublin: James Doran 0-6, Ross McGarry 0-4 (2fs), David Lacey 0-3 (2fs), Sean Hawkshaw 0-1. DERRY: Oran Hartin; Oran McGill, Conor McCluskey, Sean McKeever; Simon McErlain, Padraig McGrogan, Conleth McShane; Oisin McWilliams, Dara Rafferty; Patrick Quigg, Richie Mullan, Odhran Quinn; Ben McCarron, Lorcan McWilliams, Mark McGrogan. Subs: Fergal Mortimer for Dara Rafferty (30), Callum Brown for Odhran Quin (32), Declan Cassidy for Patrick Quigg (36), Martin Bradley for Simon McErlain (56), Jon Paul Devlin for Ben McCarron (59), Tiarnan McHugh for Oisin McWilliams (60). DUBLIN: David O’Hanlon; Darren Maher, Peadar O’Cofaigh Byrne, Liam Flatman; Kieran Kennedy, Neil Matthews, Eoin O’Dea; Donal Ryan, Mark Tracey; Daniel Brennan, James Doran, Karl Lynch Bissett; Ross McGarry, Sean Hawkshaw, David Lacey. Subs: Fionnan O’Sullivan for Daniel Brennan (40), Ciaran Archer for Sean Hawkshaw (46), Gavin Nangle for Peadar O’Cofaigh Byrne (52), Luke Doran for Darren Maher (60), Niall O’Leary for Kieran Kennedy (60, BC).